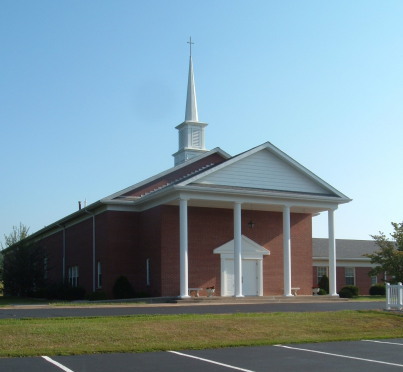 Our church is located on the east edge of the town of Paoli, surrounded on two sides by farm land. 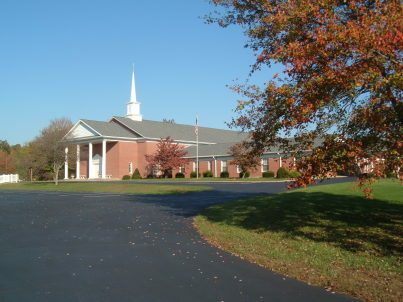 Click here for directions to the church. 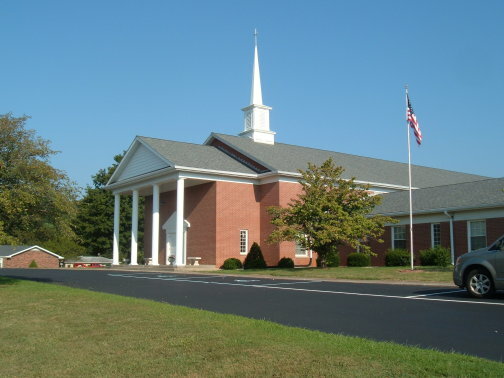 We built our new building and moved out from the center of town in the early 1970s. Click here to see the history of this big construction project and move. We are pulling into the large blacktopped parking lot. Around on the east side we have a covered entrance, turn to the right past this tree to reach it. A driver can stop under this cover and let their passengers get out and walk into the church without being exposed to rain. Here you see the main entrance and the west side. 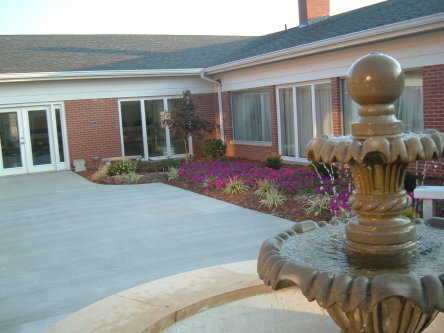 Both the front door and the side covered entrance are accessible to the handicapped. Wheelchairs are available at the entrances for those who need them. We consecrated this building in 1972, after the merger of the Methodist and Evangelical United Brethren churches. See the history pages for background on the Methodist and United Brethren churches in the United States, the Methodist and E.U.B. 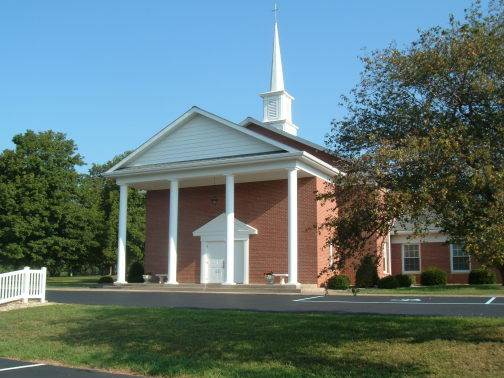 churches in Paoli, and the merger and construction. The Colonial style of the red brick church reflects our country's heritage. The small window panes are found in many of our country's historic churches. Our sanctuary looks unusually empty on a quiet weekday morning! The decor in the sanctuary is subdued to draw one's eyes to the empty Cross that reminds us of the risen Christ. The vaulted ceiling of the sanctuary has chandeliers that provide lighting with recessed lighting fixtures with dimmer controls to highlight the activities in the chancel area. At the center you see the pipes of our organ, which was first put into service in 1927 in the old Methodist Church building near the center of town. At either side you see the screens for our dual video projectors, used to project a short video program at the beginning of each worship service and then a short video relating to the sermon message at the end of each service. They are also used to make announcements about upcoming church events, list birthdays and wedding anniversaries, and project the lyrics of hymns. Here it is on a Sunday morning. This looks more typical! The audio and video control system is located at the rear of the sanctuary. Our wireless amplified system allows the hard of hearing to better hear the message and the music. 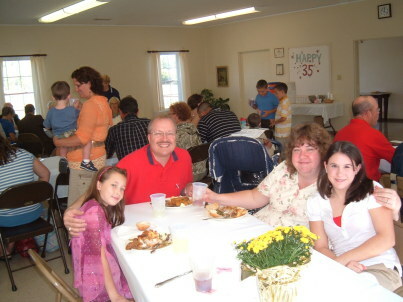 Our Fellowship Hall provides a space where our members and other large groups can gather for meals. 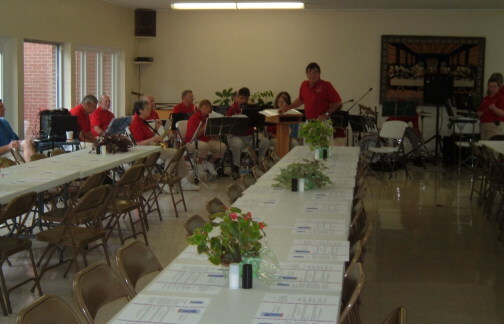 Here we see a band warming up as they prepare to play during a benefit dinner for the Samaritan fund, a local mission we support. 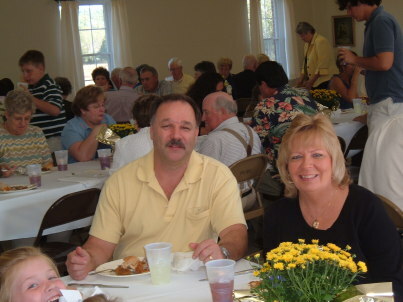 The Fellowship Hall has a large tapestry of the Last Supper which makes for a perfect setting for the pitch-in dinners, wedding receptions, and meals served after funerals. The Fellowship Hall is often used for projecting movies. The hall is also used for the visits of the Red Cross Blood Bank, and for the Life Line Screening which our church hosts each year. The screen is a prevention measure for vascular diseases such as stroke, heart disease, high blood pressure, high cholesterol, diabetes, irregular heart beat, and history of smoking. The hall also is a hot spot with wireless Internet connectivity. 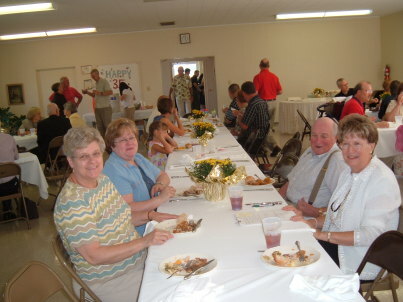 Below are some pictures from a recent church dinner. 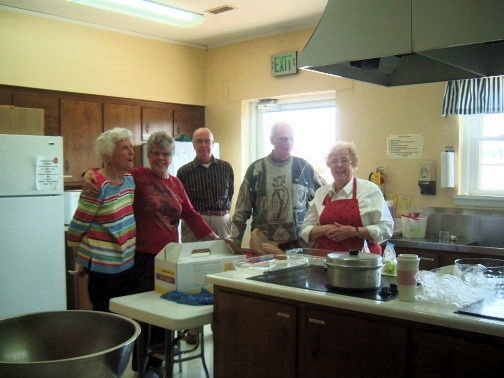 Members use the church's kitchen to prepare meals. Here you see our members cleaning up after some of our church dinners and preparing the annual Samaritan Fund benefit dinner. 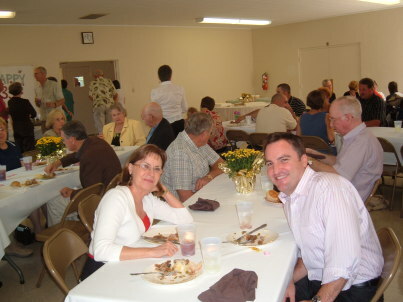 A meal at the church after a funeral is often part of the celebration of a member's life in the church. 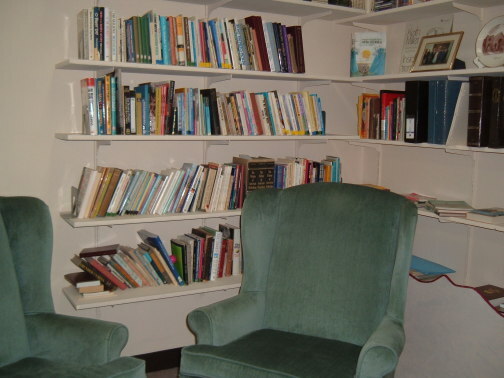 The church library has comfortable chairs for reading, plus a desk. The books and maps may also be checked out for study at home. 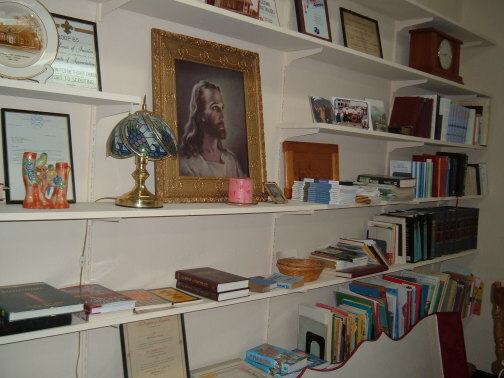 The church library has a collection of Bibles, commentaries and other Bible references, maps of the Holy Land, plus many other books for both adults and children. 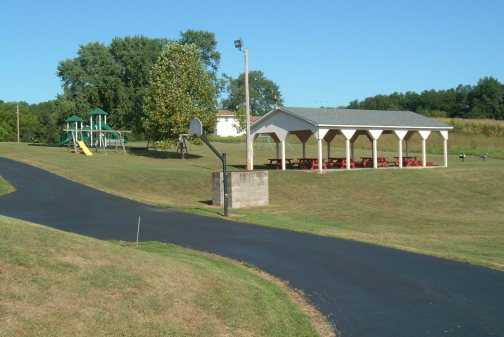 We have a playground for the children, a basketball court for the youth, and a picnic shelter for outdoor dining. 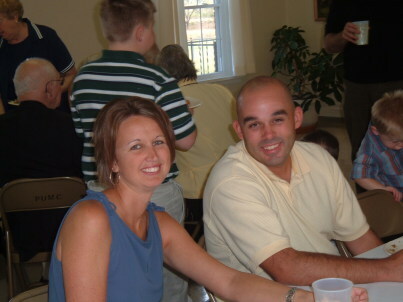 Also see the pages describing our Adult Bible study and Sunday School programs, where you can see our classrooms. 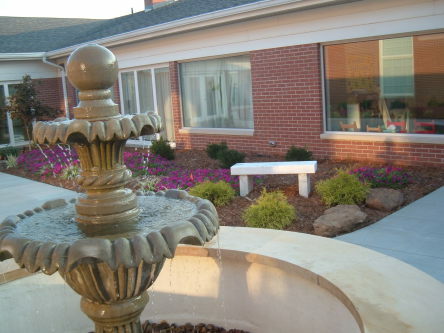 The beautiful prayer garden is in the central courtyard with trees, flowers and a fountain. 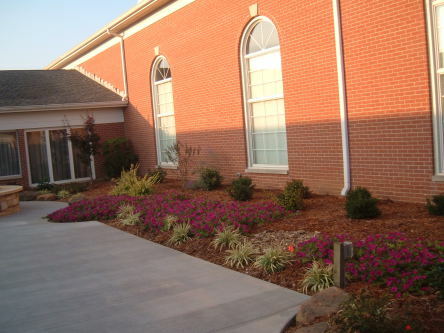 The garden is used by the children's Sunday School classes, for the annual Easter egg hunt, and for story telling during Vacation Bible School. 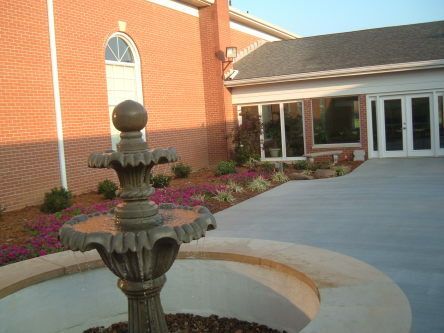 The garden, which is accessible from our Fellowship Hall and two of the Sunday School rooms, has been the site for several outdoor weddings. 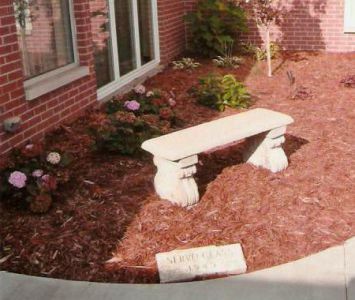 The Servo Class donated a granite bench for the prayer garden. 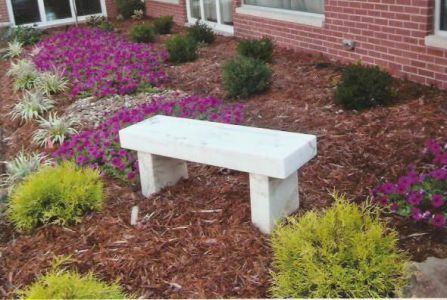 A white marble bench was recently added to the garden. It was donated in memory of a deceased member. 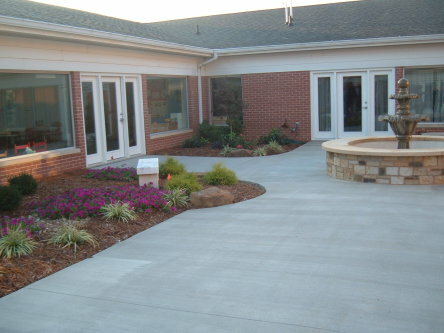 In the spring of 2013 we rebuilt the prayer garden, adding new walkways, and planting new flowers and trees. 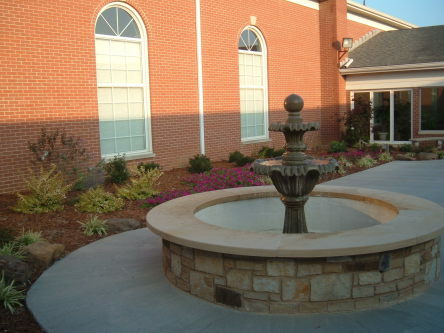 We also built up a raised seat around the fountain.